Crop produced by your farms is stored in the granary. The great granary offers you more space and keeps your crops drier and safer than the normal one. 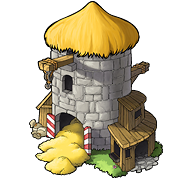 After building up one great granary to level 20, additional great granaries can be built. This building can only be built in the old Natarian villages (these villages are holding a Wonder of the World) or with special Natarian artefacts. Please note that in a Wonder of the World village, the building times will be half of what they are in villages holding a great granary/great warehouse artefact.